Recounting my entire trip would make one very long blog post, hence there are three parts to my 'Seclusion and Shopping in Thailand' series. 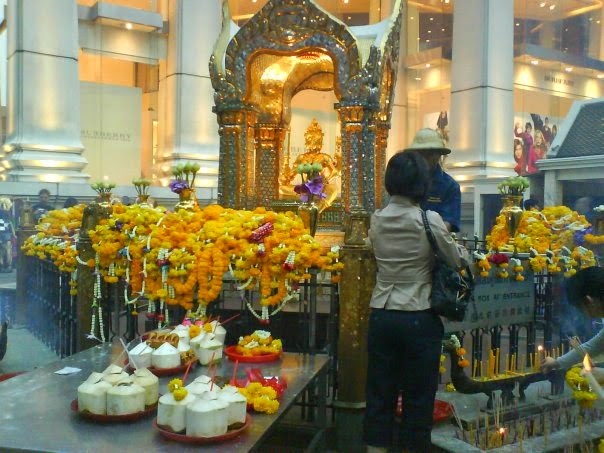 Bustling Bangkok was the first and this one is my second. There is so much this country has to offer. Some things you can make sense of and some which just do not fit into the puzzle. Some which amuse and some which bemuse. I am sharing these accounts which really struck me on my trip. I loved every restroom I visited! No kidding. No matter where or in how remote a location I was, the loos I went to were spotlessly clean, and even better, there was no stench. Some even had not one but two hair dryers in there! For a country so blessed with exotic flora, its people really know how to beautify their space with some fresh colorful flowers. The many huge floral installations at the airport were a pleasing-to-the-eye sight and a sheer work of art. You will also find flowers owning a rightful place on a plate of food or in a glass with your drink. Another thing I love is how the young locals carry themselves – the girls are clad in the prettiest of dresses, sporting the trendiest hairdos and make-up, and the guys ride by on their cool and very colorful Vespa! Their people seem like a peaceful lot. Busy as they may be, you will always find some of them with their eyes closed and hands folded in prayer at the many temples that dot the busy streets of the city regardless of the weather or hour. What I also realized in this trip is that their English has gotten better – in my last trip, I faced tremendous difficulty in communicating. I clearly remember the last time, my simple, well-pronounced request of "No prawn in my Tom Yum" warranted me Tom Yum with not only prawns, but crab, squid and lobster meat too! Do not miss out on a ride in the local tuk tuks, all most certainly ridden by men who enjoy living life on its edgiest of edges! You might find it tough to believe but one tuk tuk can easily accommodate 5 people and 4 shopping bags. Yes, tried, tested and confidently shared with you! 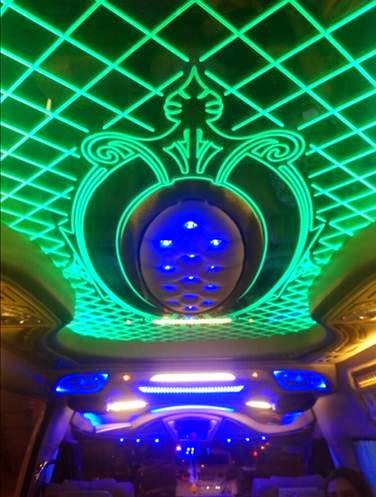 Another amusing and tremendously funny thing I spotted was the ceiling interiors of the two vans arranged for our airport transfers – one had mirrors with gaudy dim neon lighting that changed colours, and the other had a patterned work with lights and surfaces with a sleek wooden finish. Now you know what I mean? Thai people are a superstitious lot; do not think your eyes are playing games with you if you do not spot the number ‘13’ in the lift of a building. Since the number is considered to be unlucky, it is just convenient if a floor with that number is avoided! Devour the food. Take your time while eating. 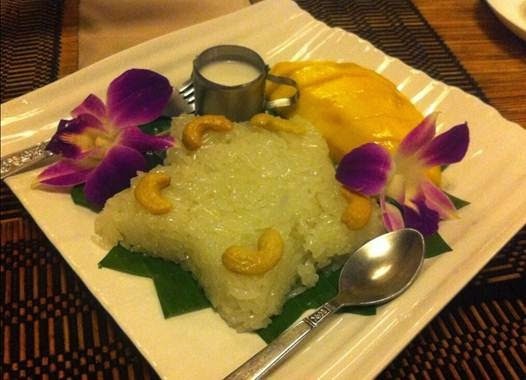 Enjoy the freshness of the fruits and the crunchiness of the vegetables. 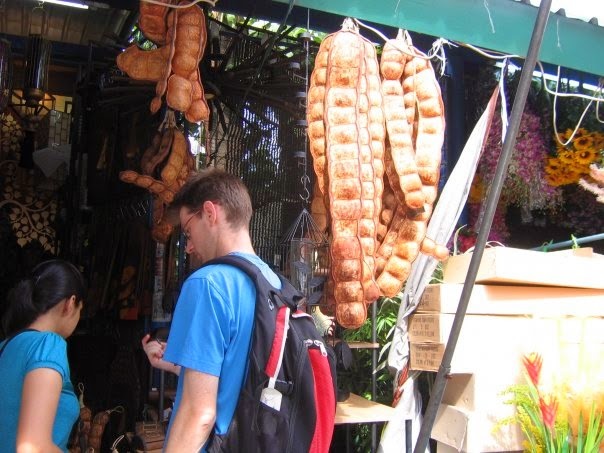 Visit the local market where you are sure to spot things you have never eaten or seen before. The streets are dotted with small food carts selling fresh mango and sticky rice, satays, sausages, fresh grapefruit and other local produce. 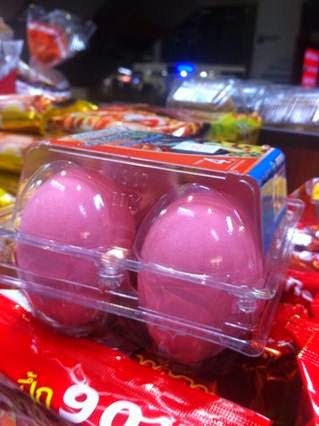 Preserved eggs with pink shells..packed and ready to eat. Spotted these at the airport. 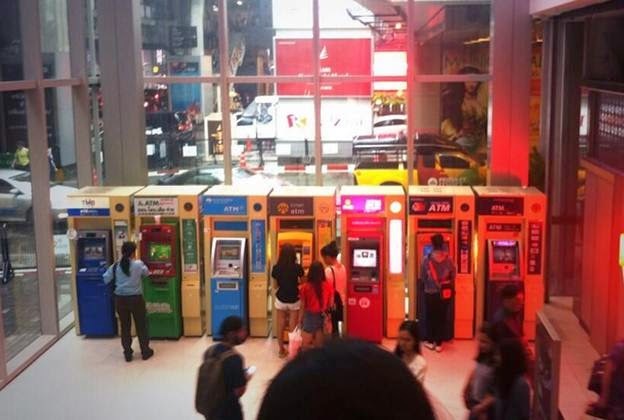 Everything in Bangkok is colorful, even a string of adjacent ATMs. If you have read this post of mine, you probably know my liking for a Vespa, and in Bangkok I saw the fanciest and most rainbow coloured Vespas on the road. With Taylor Swift's name plastered over an Air Asia plane and Taylor Swift special edition green tea flavoured Cornetto, I figure Asia is really bowled over by this love-torn songstress. 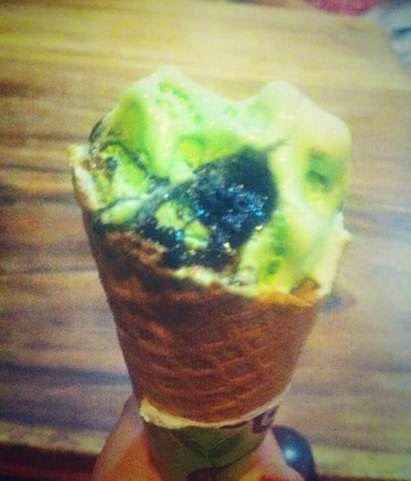 By the way, the Cornetto was delicious! Skip the usual key chains and fridge magnets and go creative with your souvenirs. Visit the local supermarket and stock up on the different flavoured Pocky Sticks and ramen noodles and bring them back for your folks. 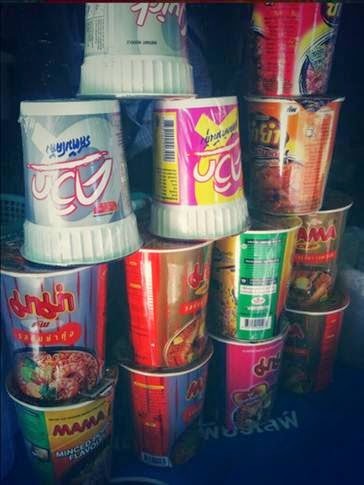 Different flavoured cup noodles stacked atop another.